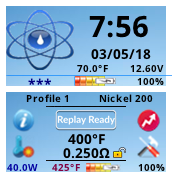 Showing results for tags 'horizontal'. 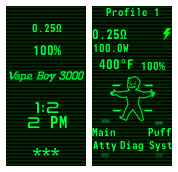 Original Vapeboy 3000 by Ash Cordill One of the features this theme shows off is the ability to use the battery level as conditional actions. 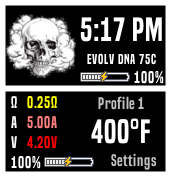 The battery gauge with turn from green to red every 10% down to 30%. The pip boy's limbs will also cripple as the battery goes to 85%, 70%, 55%, and 40%. Edited By EDcreative. Turned theme into a portrait/vertical, re positioning items as needed.